AEserver Review 2019: Is AEserver a Good Hosting? Based in the United Arab Emirates, AEserver (formerly Engage LLC) was founded in 2005 as a service to help local businesses register domain names. Its early entry in domain registration services allowed the team to recognize an opportunity to provide hosting infrastructure as well, and the rest is history. AEserver has since built an outstanding reputation in the region as a value-priced company that provides excellent hosting on a solid infrastructure backed by speedy and helpful customer service. AEserver offers both Linux and Windows hosting. It features straightforward shared hosting plans at three levels and a good variety of options for cloud hosting as well. In addition, you’ll find managed WordPress, Joomla, and Magento hosting plans. A free domain name is included with every plan. 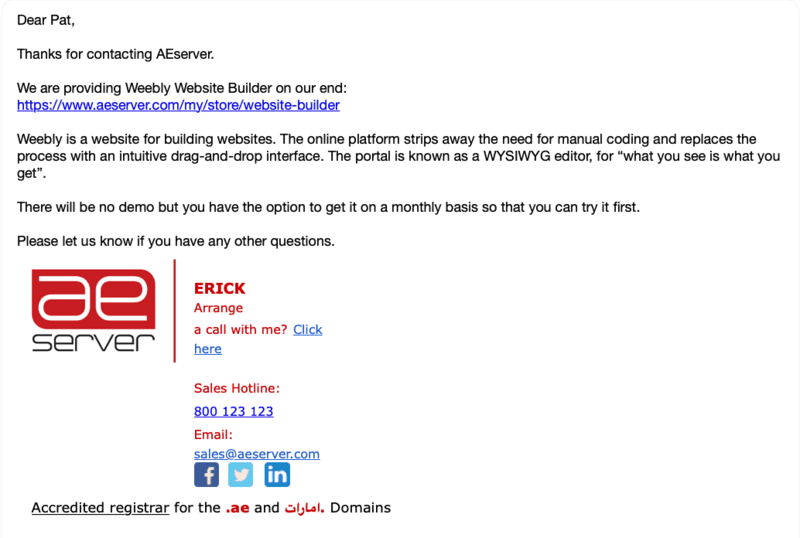 AEserver has integrated the popular Weebly website builder into the service. You can actually sign up for Weebly through the AEserver control panel. There’s good news and bad news here. If you like Weebly, it’s convenient. But Weebly comes at an additional monthly expense, so if you prefer a proprietary builder bundled with your hosting to build a custom website, you’re out of luck. Fortunately, there’s support for free CMSes like WordPress, Drupal, and Joomla, so beginners will at least have a bit of help there. Unfortunately, there’s no uptime guarantee, and backups and SSL certificates come at an additional cost. Since AEserver is located in the UAE, the vendor’s prices depend heavily on currency exchange rates. At the time of writing, its shared hosting packages are fairly expensive in U.S. dollars relative to what they offer. The shared hosting plans are fully-featured for the most part, although the lowest plan only offers 1GB of disk space, so it won’t be enough for many users. The cloud server plans, on the other hand, offer a great deal of flexibility in terms of CPU cycles, RAM, and storage. They are offered at a reasonable price and there are ten plans to choose from. Customer support is good with available phone support during Dubai business hours from Saturday to Thursday and/or ticket-based issue management. Replies to inquiries were prompt and helpful. They offer support in English only. AEserver is a high-performance hosting provider with mid-level pricing and something for just about everyone, but is an especially good choice for companies who need to do business in the Middle East. Wondering how AEserver stacks up against other Web Hosting companies? Enter any other Web Hosting company and we will give you a side-by-side comparison.